A diving watch offers a series of technical characteristics that make them suitable for use underwater up to their rated depth. These comprise water resistance, with each watch tested in water under pressure, a unidirectional rotating bezel on which the first fifteen minutes are marked minute by minute for increased precision at decompression stops, hour and minute hands that are visibly different, and a means of determining whether the watch is functioning – usually the seconds hand. The three hands and the dial markings have to be visible in low light conditions. 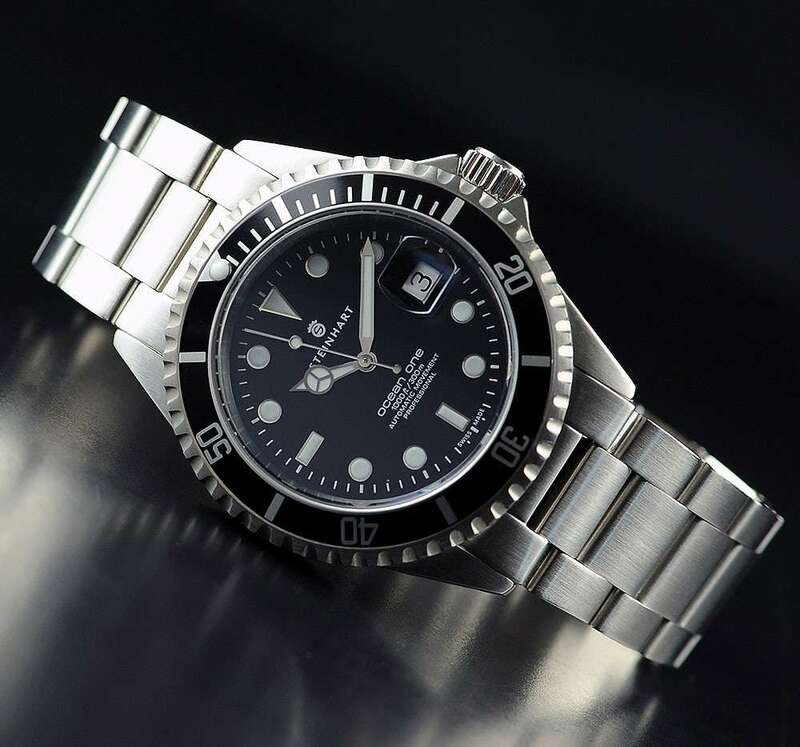 Diver’s watch requirements are set out in the standard ISO 6425, but not many manufacturers submit their watches to obtain this certification. The diver’s watch has developed its own aesthetic over the decades, and thanks principally to the Rolex Submariner, it has become a classic design, suited to all sports casual looks. 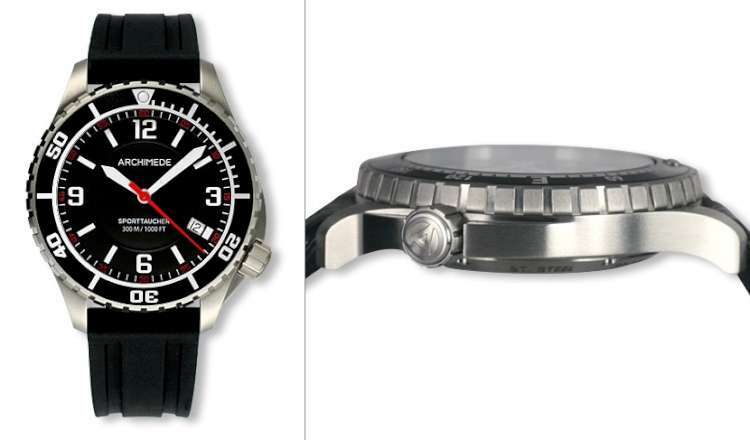 Perhaps more than other watch genres, entry-level diver’s watches – at least those listed here – have excellent quality and finish and all represent good value for money. This selection – actually 16 watches – is in increasing price order. First posted on 28 Dec 2016, updated 8 August 2017. The Helm Vanuatu has a lot going for it. First and foremost, price. US $275, plus $30 world-wide shipping, makes it an attractive proposition. It is a dive watch, 300 metres water resistance. 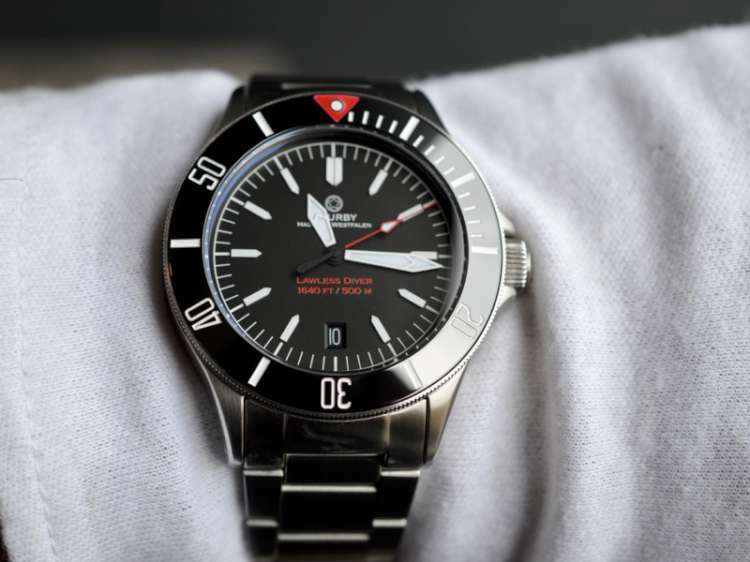 Its unidirectional rotating bezel has minute markings all the way around and so it can be used for approximate timings of any event, whether under water or on dry land. Its bezel projects half a millimetre from the case, which makes it practical to rotate. It’s large, but not so large as to be impractical. You get a stainless steel bracelet plus a nylon strap, with a choice of four colours. Inside, a self-winding mechanical movement, of excellent precision. This watch by Steinhart is a tribute to the Rolex Submariner, though it is larger at 42 mm as compared to the Rolex’s 40 mm. Its lug design makes it less comfortable if you have a small wrist, because the lugs are substantially horizontal. The unidirectional rotating bezel reflects the Rolex original, with a circular bead of SuperLuminova inside the triangular marker, and a ratchet with 120 positions. The screw-in-caseback is solid, with an engraving of a Trojan and a seahorse. The watchglass is thick and robust, with a cyclops lens glued on top for date magnification. Dial and hands are impeccably finished. Inside, the ETA 2824-2 movement runs at 28,800 vibrations per hour (4 Hertz), with 38 hours power reserve, and it has the stop-second function for precision setting. At a price of €380 inclusive of VAT, this watch is remarkable value for money, considering the high level of finish. Available on the Steinhart website. 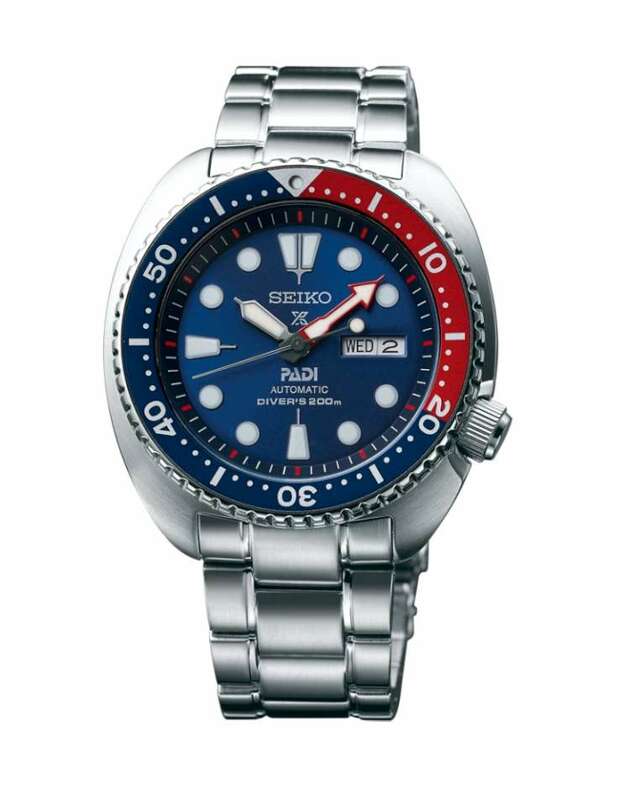 Seiko has a long history of quality diver’s watches at amazing value, and the SRPA21K1 continues the tradition. It is a watch released as part of the partnership with dive instruction organization PADI (Professional Association of Diving Instructors). This is a large watch at 45 mm diameter, in a distinctive cushion-shaped case with a stainless steel caseback. Water resistance is 200 metres. The screw-down crown is placed at 4 o’clock. The stainless steel bracelet has a three-fold clasp with push button release, and a dive extension. The watch is powered by Seiko’s 4R36 calibre, which is automatic, can be hand-wound from the crown, and has the stop-second function. It has a power reserve of about 41 hours. The balance runs at 21,600 vibrations per hour, 3 Hertz. This is the only movement in this article to be built directly by the manufacturer – all the other watches featured here have third-party calibres. Hands and dial markings are coated with Seiko’s own proprietary Lumibrite. List price about €449 inclusive of VAT. See more at the Seiko Prospex website. The 1000 in the name of this watch refers to the depth rating in feet, corresponding to 300 metres. 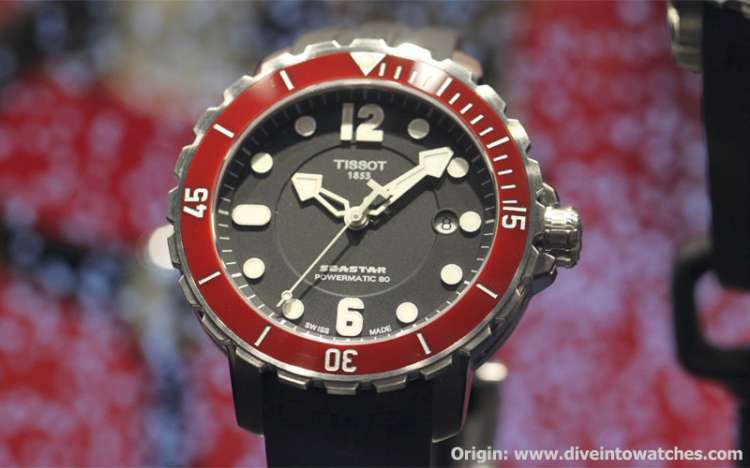 In addition to the usual diver’s watch features, the Tissot Seastar 1000 has a helium escape valve for safe decompression in a helium mix atmosphere. The rubber strap has a diver’s extension. The case is 42 mm in diameter, 12.4 mm thick, and inside, the Powermatic 80.111 movement made by ETA has the excellent 80-hour power reserve that hallmarks the new generation of ETA calibres. This is obtained in part by reducing the balance frequency to 3 Hertz, and by increasing the length of the mainspring. The movement can be viewed through the display caseback. Finish is good, with the red ceramic bezel having markers cut out and not printed, and interesting skeletonized hour and minute hands. The dial design is modern, with some neat touches such as the circular date window that exactly matches the circular hour markers. All in all, it’s an attractive watch, with the black dial, and red ceramic bezel with its large notches, giving it a distinctive appearance. The watch, reference T066.407.17.057.03, costs €775. 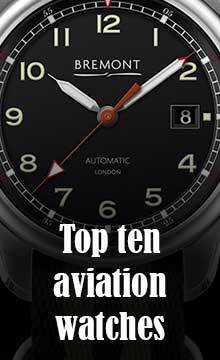 Available from the Tissot website. 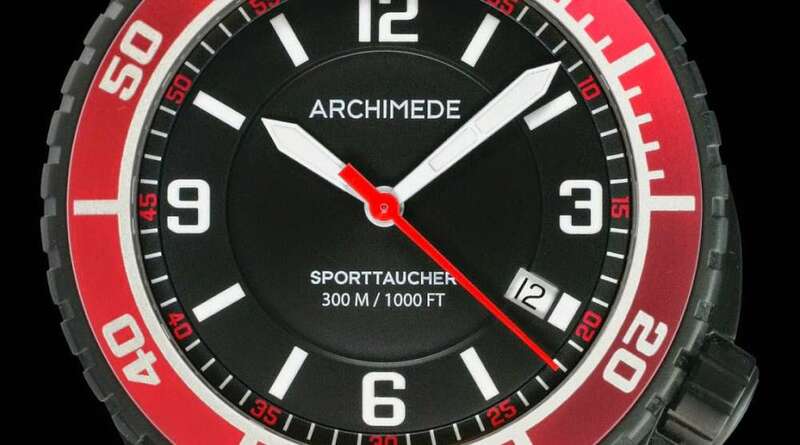 The watch by Archimede has a 41.5 mm diameter case, 12 mm thickness, water resistance 300 metres, with a rubber strap. It is powered by the Swiss-made Sellita SW 200-1 automatic movement, with a balance running at 28,800 vibrations per hour, 4 Hertz, 38 hours power reserve. It has a solid screw-down caseback, and a screw-down crown. The watch is a little different from most dive watches, in part for the crown at 4 o’clock neatly aligned with the date window, and in part because two of the classic dive watch features are missing. The sword-shaped hands are identical in format for hours and minutes, and the seconds hand is red, with no luminous coating, and so in low light conditions there is no way of telling whether the watch is running or not. The watch costs €820.00 inclusive of VAT. It is available from the Archimede website. 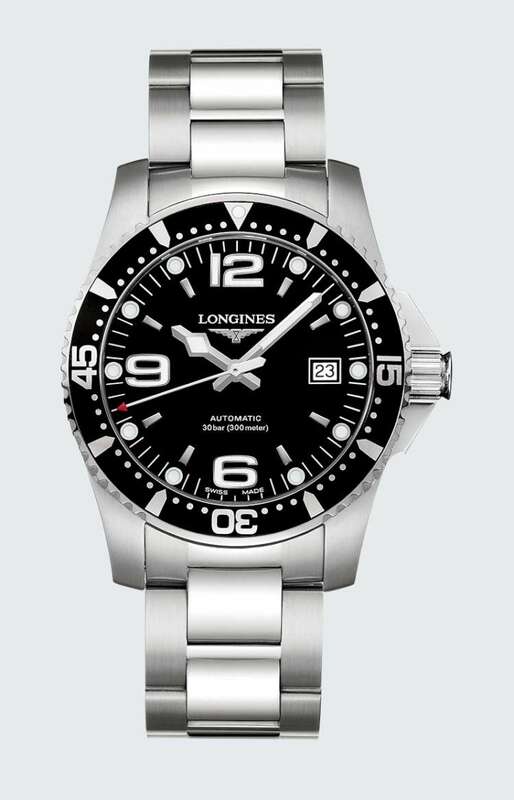 The Longines Hydroconquest provides most of the classic diving watch features – water resistance 300 metres, automatic movement, unidirectional rotating bezel, screw-in crown, good luminescent dial markings – in a 41 mm case, at an attractive price considering that it’s a Longines and therefore in the medium price bracket. Inside, it is powered by the Longines calibre 633, supplied by ETA and based on the tried and trusted 2824. The dial is supremely legible with its giant Arabic numerals: in the dark, the hour dots and the Arabic numerals all glow satisfactorily, along with hour and minute hands. 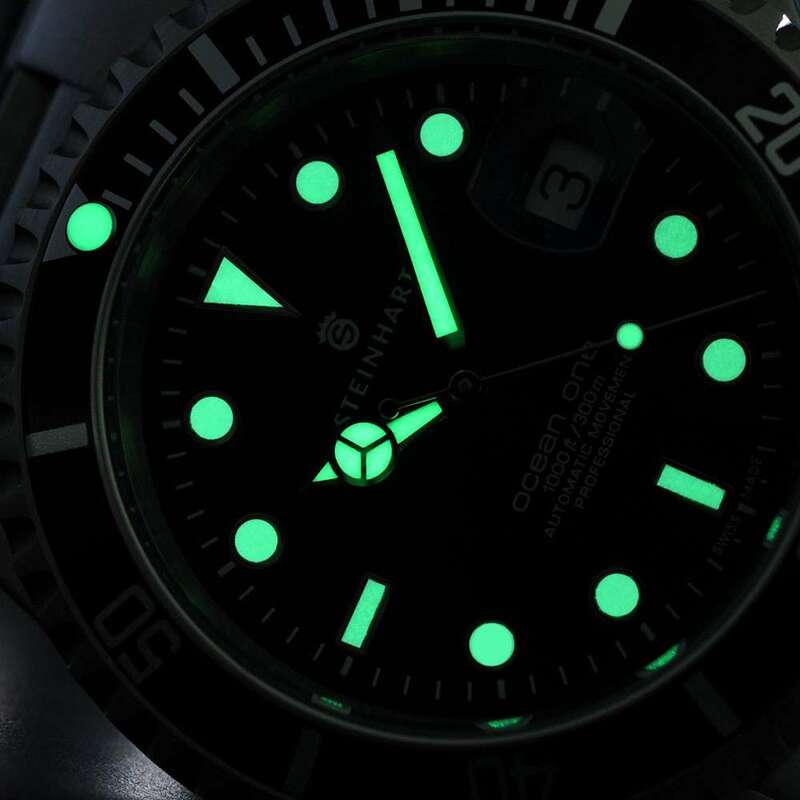 The seconds hand has no luminescent paint, and so one of the dive watch features – being able to discern whether the watch is operating both in normal and low light conditions – is missing. The case and bracelet (it is also available with a rubber strap) are beautifully finished, with contrasting satin and polished surfaces. The clasp has an integrated diving extension, and the case has a solid caseback. Price €940 inclusive of VAT. More information from the Longines website. 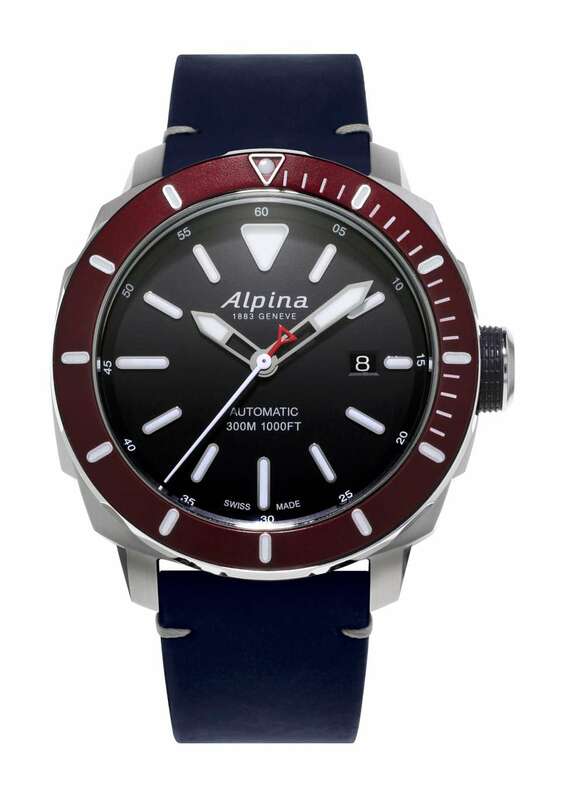 This watch by Alpina is large at 44 mm, and it has a distinctive bezel, with various bezel colours including the red that is an Alpina characteristic. The screw-in crown contributes to the water resistance of 30 atm, 300 metres. 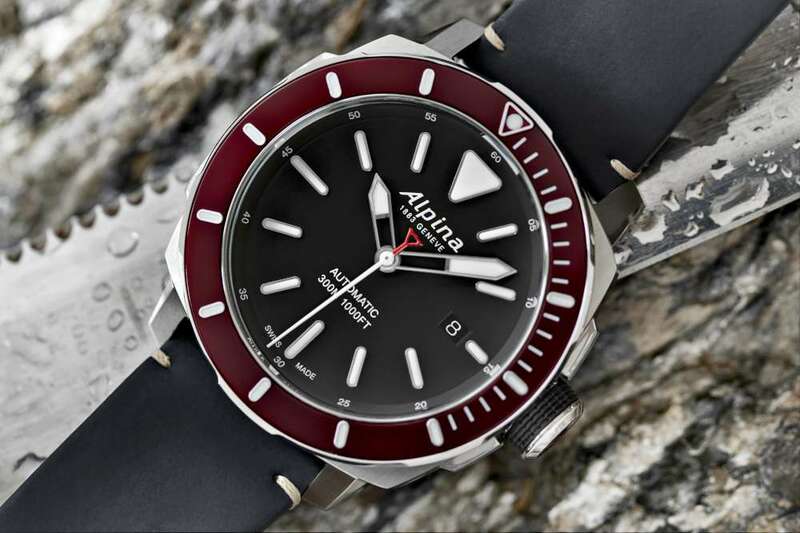 The watch is powered by the Alpina AL-525 movement, which in actual fact is a modified version of the ETA 2824-2 automatic, with an Alpina oscillating weight and some extra decoration, visible through the display caseback. It runs at 4 Hertz, and has a power reserve of 38 hours. The strap is in rubberized nubuck. The watch costs €1,139 including VAT, or about $1,395. More information on the Alpina website. This model, the latest piece in Tourby’s Lawless range, has a 42 mm case, 13 mm thick, water resistance 50 bar, 500 metres. 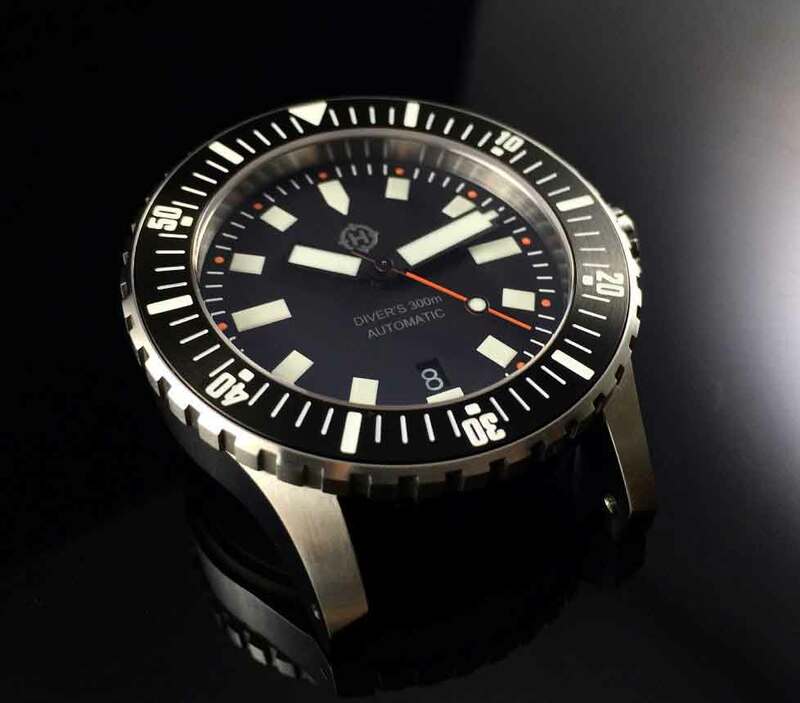 The name suggests a sort of anarchic watch but in fact it refers to professional diver Brendan Lawless. The red in the name is a reference to a red triangle on the black bezel, and the red second hand, coordinating with the red text. The bezel is attractively slim with very subtle fluting, and has 120 ratchet clicks. The symmetry of the dial is enhanced by the date at 6 o’clock. The luminescent paint on hands and hour markers glows blue (BGW9 SuperLuminova). The caseback is solid and is decorated with an intricate die-stamped relief design. Inside, the ETA 2824-2 automatic movement runs at 28,800 vibrations per hour (4 Hertz), power reserve about 40 hours. The bracelet is nicely made, tapering from 22 mm to 18 mm at the clasp, with links that also reduce in thickness to enhance looks and comfort. A rubber strap is available, a superb fit for the watch, dipping steeply down from the lugs so that it fits just about any wrist comfortably. This piece is supplied with a leather travelling case. The Tourby Lawless 42 Red Edition costs €1,300. More information on the Tourby website. 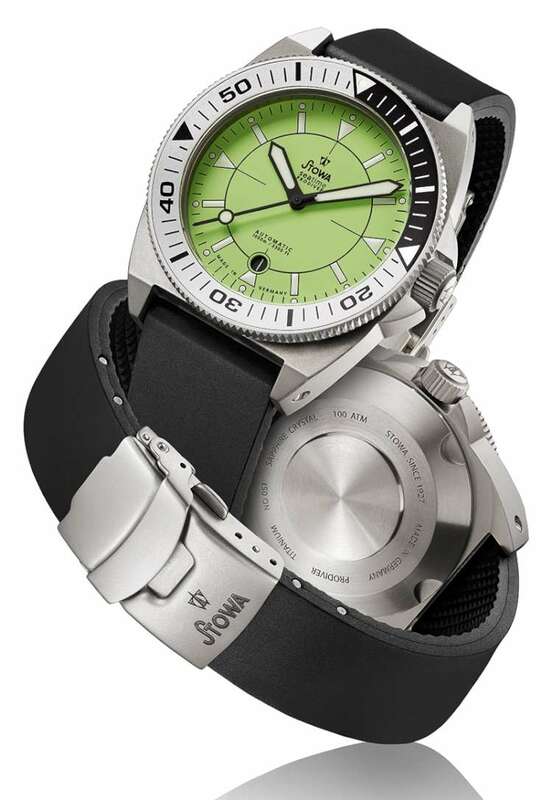 Stowa make a complete range of its Prodiver watches, which feature some fashionable colours such as this lime green, in addition to other versions with dials in light grey, dark blue, carbon, orange and black. Hands, dial hour indices and the bezel dot are coated in C3 SuperLuminova. The watch has a titanium case, 42 mm in diameter, 15.6 mm thick, with a 22 mm rubber strap. It has an appearance very different to that of other watches, with sharply angled lugs and a very attractive 60-click bezel. It is waterproof to 100 atm, corresponding to 1,000 metres, and has a helium release valve. The movement is the self-winding ETA 2824-2, with about 40 hours power reserve. The watch costs €1,220 including VAT, and it is available on the Stowa website. This is a visually striking watch, with an all-red bezel, a crown protector, black dial with applied indices coated in SuperLuminova, and an unusual strap. The bezel rotates unidirectionally but it doesn’t have the usual 15-minute markings. The crown protector was designed to ensure that whatever the diver does underwater, there is no risk of accidentally changing the time which could have dangerous consequences on his survival underwater. The protector is unscrewed and it lifts away from the crown which can then be manipulated as desired. 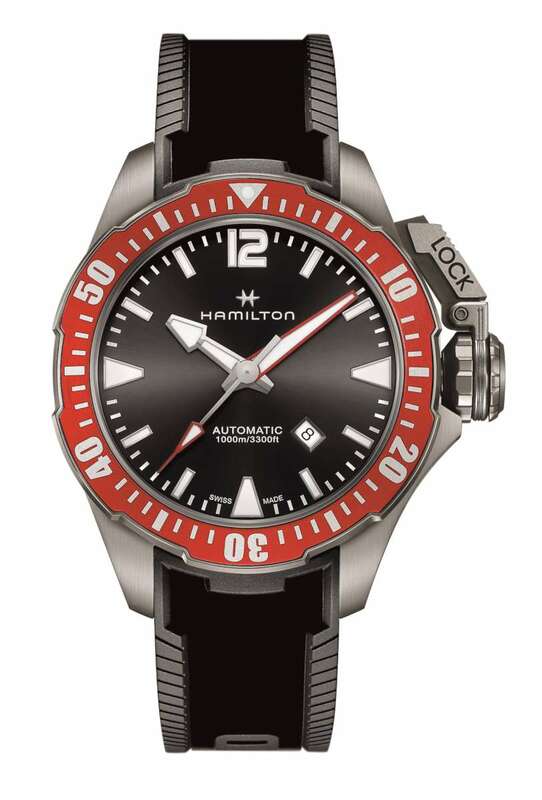 Another technical feature of the watch is a helium valve, which is not really relevant to most sports diving, but important for the ISO certification that Hamilton is currently obtaining for this timepiece. Particular attention has been dedicated to the luminous indications on the dial and hands, using a high-quality SuperLuminova formulation that provides high density and brightness. All three hands are different in design, and the seconds hand has an arrow-shaped red extremity. The date window is placed diagonally at 4.30. 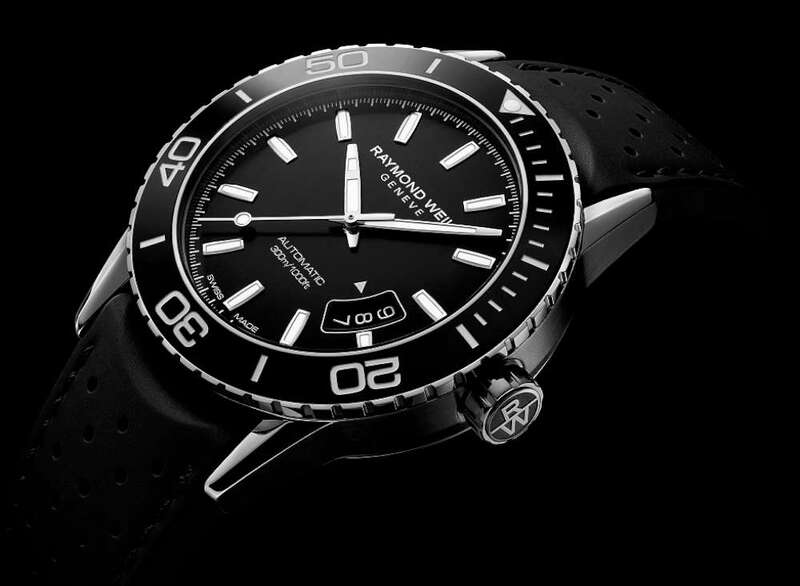 The 46 mm version has a titanium case with 100 atm water resistance, corresponding to 1,000 metres depth. The rubber strap is a surprise because at first sight it seems to be made of two materials, rubber on the lateral strips and a soft, velvety material in the centre, but in fact it is all the same rubber material, moulded using a microperforated die to produce a shark’s skin-type texture. This is a world premier innovation. The strap has a titanium buckle. The watch is powered by the self-winding H-11 movement, made specially by ETA for Hamilton and providing 80 hours power reserve. The Hamilton Khaki Navy Frogman 46 mm is reference H77805335, price €1,345, and it will available from June 2016. Read more here. Or visit the Hamilton website. 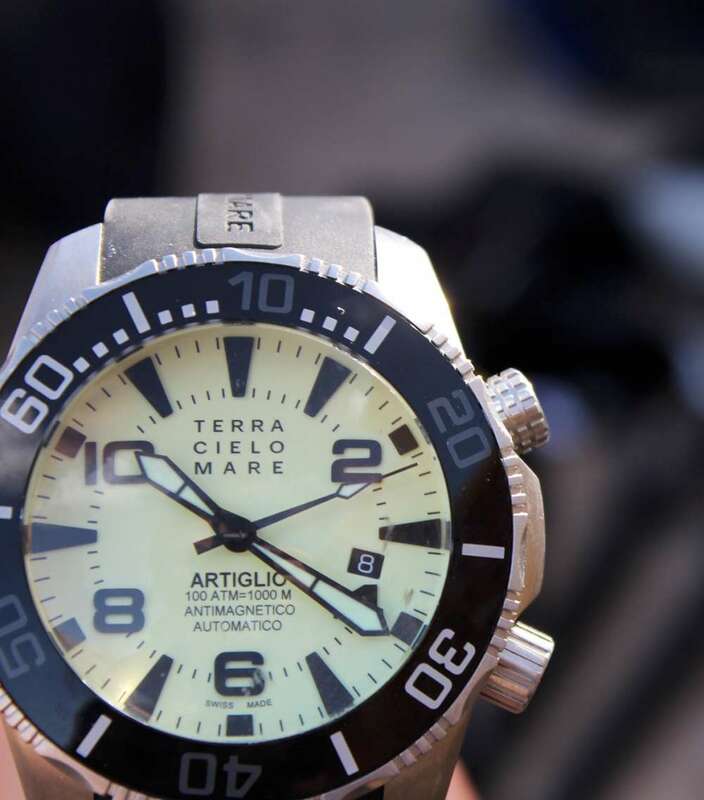 This watch by Italian company Terra Cielo Mare is named after a 1920s ship specializing in the recovery of cargo from sunken ships. It pioneered techniques of decompression and its divers attained depths previously considered impossible. The watch is a giant at 52 mm diameter, fitted with a polyurethane strap. It has a helium escape valve, and its depth rating is 1,000 metres (100 atm). The case is in titanium and steel, with a screw-down crown and screwed caseback. Inside, the movement is the ETA 2824-2, providing 38 hours power reserve. The watch costs €1,690. Further information from the Terra Cielo Mare website. This watch has some typical 1960s characteristics, such as the domed watchglass, and an internal rotating bezel locked, unlocked and operated by a second crown. The rotating bezel is bi-directional, and the second hand doesn’t have SuperLuminova, so you can’t see from the hands, in a low light-level situation, whether the watch is operating or not. The internal bezel has markings all the way around which facilitates seeing how long you have been underwater – or timing whichever event you like on dry land, using the minutes hand. 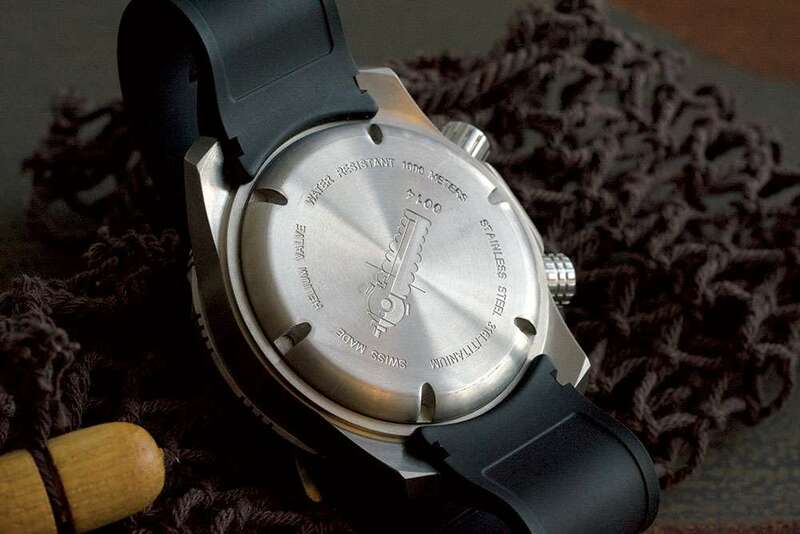 The caseback is solid, with an engraving of a diver. The two crowns are both screw-down, ensuring a water resistance rating of 300 metres. The movement is the calibre L633.5, which is the ETA 2824-2. It runs at 28,800 vibrations per hour (4 Hertz) and has a power reserve of 38 hours. Price €2,050. Read more here. 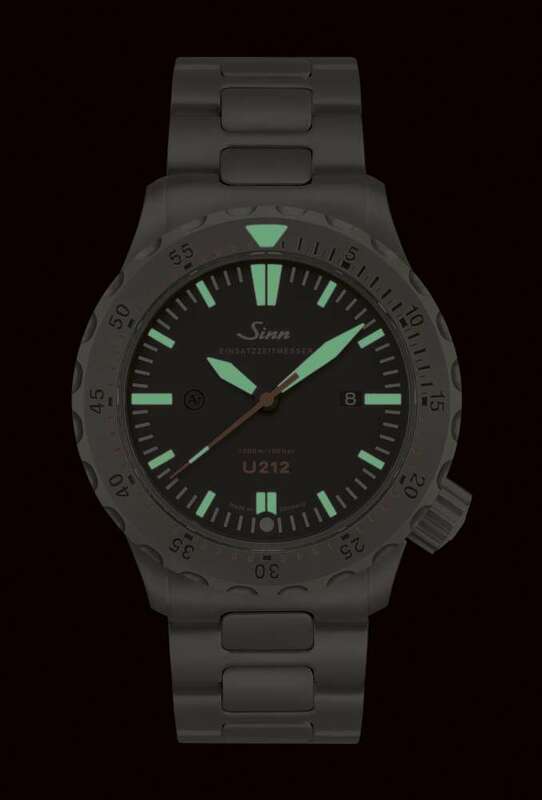 The Sinn U212 (EZM 16) is a large diving watch, 47 mm in diameter and 14.5 mm thick, with a case and solid caseback entirely made in German Submarine Steel, with satin finish. It has been tested and certified for a range of characteristics, including water resistance (100 bar/1,000 metres), low pressure resistance, shock resistance, anti-magnetism to about 1,000 gauss, and functionality at a wide temperature range (-40-+80°C). In addition, it has Sinn’s proprietary dehumidifying technology which prevents the watchglass from fogging. The screw-down crown is placed at 4 o’clock to make the watch more comfortable to wear. The timepiece is powered by the Sellita SW 200-1 self-winding mechanical movement, running at 28,800 vibrations per hour (4 Hertz) and providing 38 hours power reserve. The watch is available with different strap options, leather, stainless steel bracelet, and silicone strap. It can be purchased directly online from the website http://www.sinn.de/. Price for the watch with leather strap is €2,290; with stainless steel bracelet, €2,445; with silicone strap, €2,445. Read more here, or visit the Sinn website. 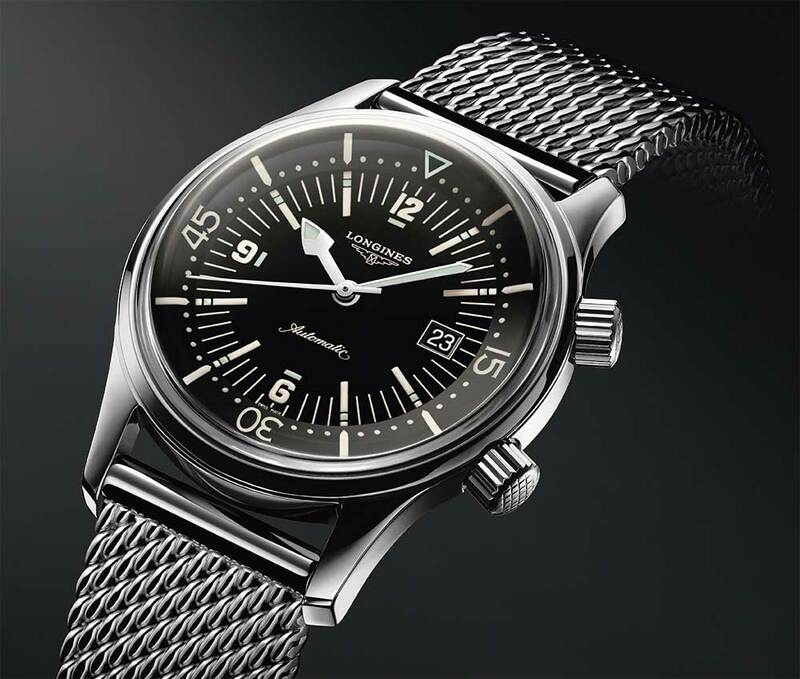 The Scafograf 300 presented in 2016 by Eberhard & Co. has a 43 mm steel case, 12.6 mm thick, solid caseback, water resistance 300 metres. A new feature that it has with respect to its predecessor of 60 years ago is a helium escape valve at 9 o’clock. The watch has a black rubber strap or a steel bracelet. The watch has the other typical characteristics of diving watches: unidirectional rotating bezel in ceramic with luminescent markings on the first 15 minutes scale; luminescent hour, minute and seconds hands, and hour markers; and a water-resistant crown. Inside, it is powered by the self-winding ETA 2824-2 movement, power reserve about 38 hours. 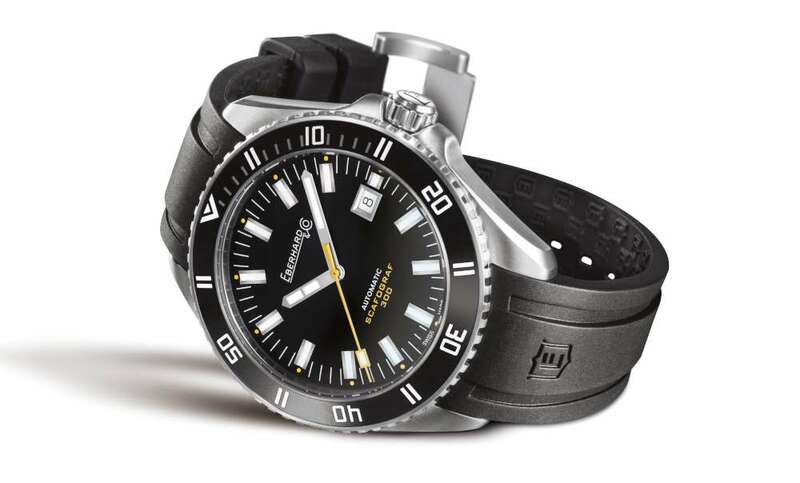 The price of the Eberhard & Co. Scafograf 300 is €2,400. The watch will be available from summer 2016. Read more here, or visit the Eberhard & Co. website. This is a functional diver’s watch based on Oris’ existing diving watch Aquis, with SuperLuminova on hands and hour indices, and a 50 bar/500 metres water resistance. One of its interesting features is the display for day of the week, which has a yellow indicator on a chapter ring midway across the dial. In a way it gives extra meaning to the date window, and adds a sort of office-environment aesthetic. The days run anti-clockwise, which I presume is due to the structure of the Sellita SW 220-1 movement which normally has the day shown in a horizontal window and was specially modified for this watch. The rubber strap has a sliding sledge system for easy adjustment, as well as an additional adjustment system on the clasp. As a result it can easily be worn over a wet suit. Inside, the Oris Calibre 735 movement is based on the Sellita SW 220-1, a self-winding movement that is a version of the ETA 2824-2. It runs at 28,800 vibrations per hour and has a power reserve of 38 hours. The Oris Great Barrier Reef Limited Edition II, reference 01 735 7673 4185 RB, is available from February 2016, at the price of €2,150, 2,100 Swiss francs. 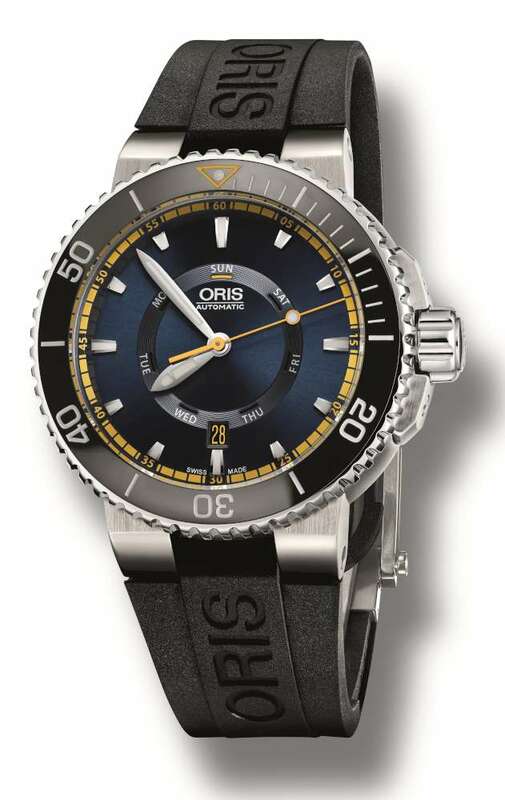 Read more here, or visit the Oris website. Raymnond Weil founded his company 40 years ago. He was a member of the Geneva Yacht Club, and so the Freelancer Realteam is like an anniversary tribute, though in actual fact it marks the company’s support for the Realteam sailing team for the 2016 season of the D35 Trophy on Lake Geneva, and the international GC32 Racing Tour. The watch is 42.5 mm in diameter, 11.8 mm thick, available in polished stainless steel or with a black PVD coating, and a black ceramic bezel. Its relatively slim size, sleek design and overall black colours make it as good for the prize-giving ceremony as for use during the regatta or underwater. 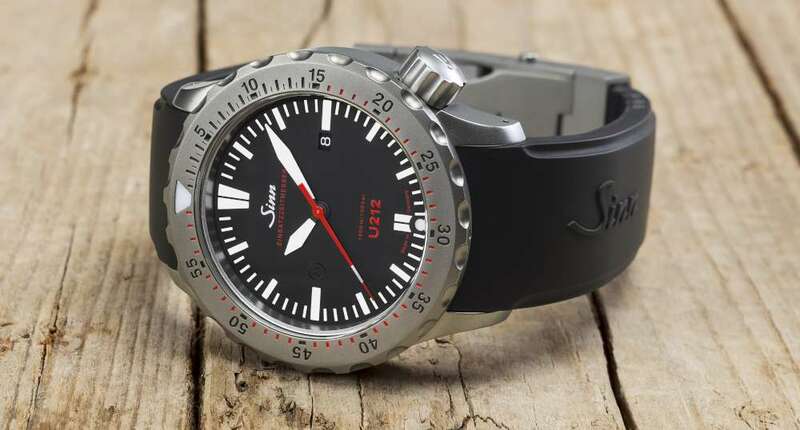 The dial layout has all the classic diver’s watch features, though with the addition of a three-number date window reminiscent of IWC’s pilot’s watches. The rubber strap has a folding clasp with integrated diver extension. The screw-down crown has the RW logo. The movement has a power reserve 38 hours and is presumably the ETA 2824-2 automatic or an analogous third-party movement. The watch is reference 2760-SR1-20001, and it costs €2,090, available in boutiques from December 2016. Further information from the Raymond Weil website. The Tag Heuer Aquaracer is perhaps the most modern and dramatically different of the diver’s watches featured in this article. The case is in titanium, with a black titanium carbide coating that gives it a distinctive surface texture. Water resistance is 300 metres, and the watch has a screw-down crown. 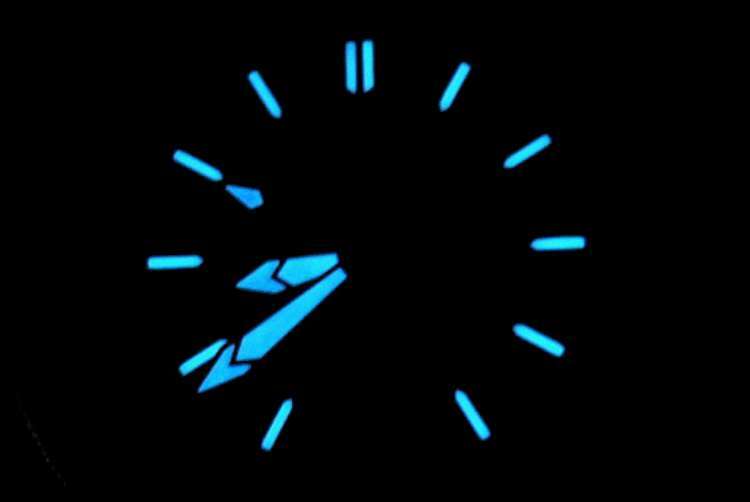 The dial has horizontal fluting, on which the blue indices are applied by hand, with grey luminescent coating. The movement is the Tag Heuer calibre 5, probably the ETA 2824, running at 4 Hertz, 38 hours power reserve. 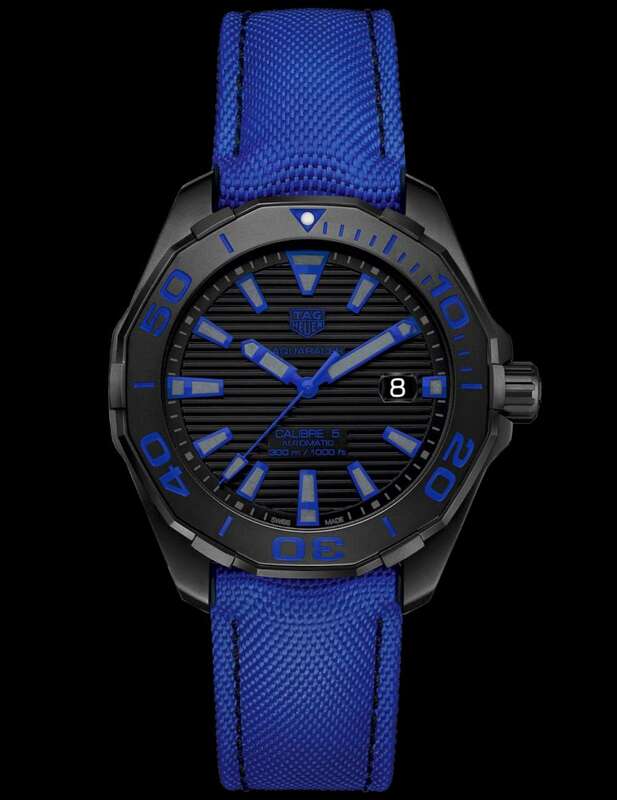 The blue nylon strap with black stitching contributes a lot to the striking appearance. The watch, reference WAY208B.FC6382, costs €2,500. Further information from the Tag Heuer website.